I believe the relationship is key in successful therapeutic work. Consequently I would work with you by building a comfortable relationship between us and providing you with a safe space in which you could unload your difficulties. I would describe myself as a authentic and warm personality, unfussy and without ego. This linked with my own broad life experience and knowledge helps me to understand, appreciate and empathise with the people I work with, developing a genuine, honest and trusting relationship and offering this in a confidential and safe space. This can help people to feel safe and comfortable enough with me, to open up and explore their private thoughts and could be the reason why you might feel ready to work with me, to try to resolve the difficulties you are encountering, past or current. I am a BACP Accredited Counsellor whose professional experience has concentrated particularly in issues surrounding childhood sexual abuse; however I also trained with Relate as a couple counsellor and work with individuals 1 -1 on relationship issues in addition to couples on relationships of all types. 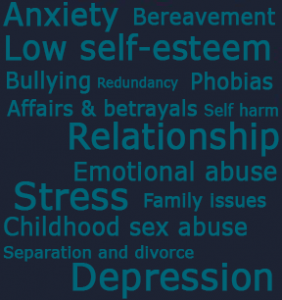 I also work in many other areas such as loss and bereavement, depression, work difficulties, gender issues, stress/anxiety, low self esteem or confidence. Essentially I work with the person rather than the issue to find what helps the individual. I work by offering a genuine warmth, empathy and respect, encouraging you to express your thoughts and feelings. This might help you to see your situation from a different perspective, which can help to reduce the anxiety, confusion and unhappiness which can surround us all at different times in our lives. With my support you might then, identify, build and create new challenges, strategies or ways of looking and going forward. If this appeals to you, please, give me a ring or email me and we can begin by talking, to gauge how you feel. It is essential that you choose a counsellor you feel comfortable with and if that is the case with me, perhaps we can work together to begin your journey.